Almost two thirds of people say seeing live music makes them happy, with under-45s worldwide choosing going to a concert over playing video games or using social media as their favourite leisure activity, new research reveals. A new study, Live Experiences Hold the Key to Happiness (commissioned by StubHub and undertaken by market research firm Trendera), found 62% of people said attending a concert makes them happy – more than the 49% who found happiness playing video games and 47% from spending time on social media. Festivals are second in terms of live events, with 51% of respondents saying they make them happy, and sports third, at 49%. And when split by gender, women are “more musically inclined”, says the report, with 66% of female respondents saying concerts make them happy, versus 58% of men. 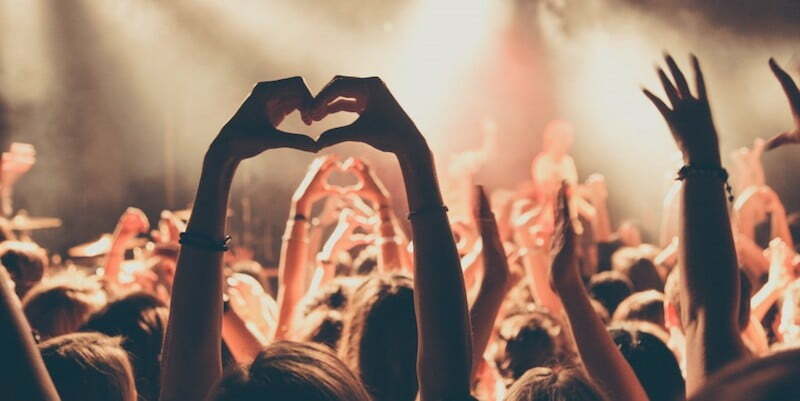 Although an earlier survey of 1,000 Australians, by researchers at Deakin University in Victoria, found the wellbeing of those who attend concerts is “significantly higher” than people who don’t, StubHub/Trendera’s study cast the net wider, surveying 2,000 18- to 45-year-olds in 20 cities: New York; Los Angeles; San Francisco; Chicago; Dallas; Boston, Massachusetts; Miami; Phoenix, Arizona; Washington, DC; Barcelona; London; Paris; Berlin; Madrid; Lima; Mexico City; Rio de Janeiro; Rome; Sydney; and Toronto. 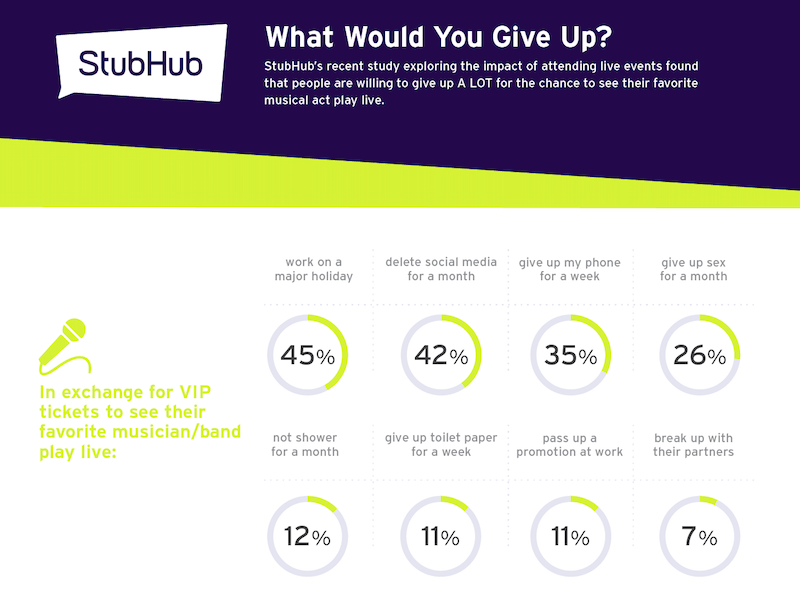 Among StubHub/Trendera’s other findings are that 75% of people cite “making unforgettable memories” as the best part about attending a live event; that an average of 40% of respondents would travel internationally for a live event (27% of Americans and 51% of those outside the US); that people would rather to a gig with Hillary Clinton than Donald Trump; and that 45% of people would work on a public holiday, 11% would give up toilet paper for a week and 7% would break up with their partner to see their favourite artist live (see below infographic). Read the full report on the StubHub website.